Anyone who has ever moved into a new house or has redecorated their home will know that the struggle of moving furniture, getting pots and pans, and just making your house look pretty is real, very real (to say the least). Plus, if you’re lazy, good luck getting anything done, really. But, we’re still going to try to make your job a lot easier with our lazy person’s guide to redecorating. Everything on this list is shoppable online, so you don't have get out of your house, really. The Pepperfrys and Urban Ladders of the world are a great place to start with, but in case you need more options – Whatsapp or email these two furniture guys on Jail Road for cane couches, sofa sets and dining tables. They’re more than happy to share product catalogs and coordinate furniture customisations over WhatsApp. If you're looking for relatively affordable (but pretty) furniture, Home Essential's cabinets, chairs and shelves are perfect. But if you want to do something with your vintage furniture like your Dadi’s worn-out wardrobe, Mishtoo will be more than happy to customise. Alisha also upcycles and re-paints all kinds of old furniture. N Square Studio, Home Centre and SPIN are other great options. For furniture rentals, check out Furlenco, and Handmade World for customised outdoor furniture. For stunning earthenware for both your garden and home, Studio Pottery by Jayati Mehta will be a perfect choice. Plus, if you love pastels, you’ve got more than one reason to stock up on her trays and planters. Don’t trust yourself with delicate earthenware? You’ll love Strawberry Collective‘s brass ware and wooden utensils. For a greater variety of crockery, check out World Art Community and Good Earth. We also love CuroCarte for restaurant-type bowls, tea sets and plates. Setting up and moving around a bed is such a task (Pivot! PIVOT!). Instead, why not just get mattresses, make them look pretty with gorgeous bed linen from Freedom Tree (also great for curtains) and Jaypore? Spread comfy rugs and dhurries from IDAM (we love their bed linen too!) and you're golden. Oh, and if a space has got plenty of cushions, it’s like a snug little paradise. So, check out Mohini Home Furnishings for giant kantha floor cushions, Pulpypapaya for cushion covers and beanbags – oh, and artists, you’ll love the Frida Kahlo cushion covers by One Good Thing. Beauty’s in the details but going into too much detail might seem very time-consuming and well, it requires effort too. So, why not just get a few statement pieces like lamps, vases and mirrors. Our pick? The Lohasmith. If minimalism and clean lines are more like your style, the Lohasmith’s got all the stuff you’d like. 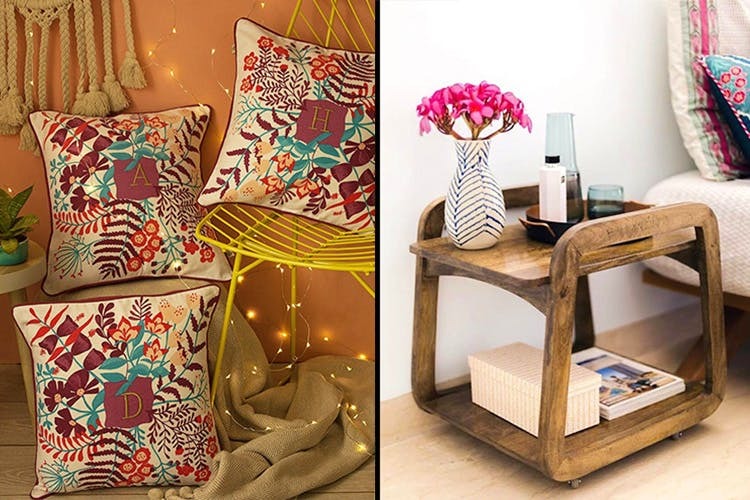 If, like us, you’re a fan of vintage, rugged lamps, you have to bookmark Gingerline and for Insta-worthy decor, try Mango People and Bigsmall. For handmade (& relatively affordable) fairy light and bottle lamps, Wasted‘s your best bet. When it comes to funky art prints/frames, coasters and bar accessories, we trust our good ol’ friend PropShop 24. If budget isn't a constraint, The Wishing Chair and The White Teak Company are worth checking out too. We’re nice people, so we’re ensuring that you have all your bases covered from Point A to Point B. How? Well, these three movers and packers will help you pack, ship and deliver all your precious furniture and appliances safe and sound. For everything from electrical fixtures and plumbing to carpentry services and landscaping issues, call these maintenance heroes. And once your home’s fully set up, avail Broomberg and UClean’s services to ensure that your house is actually party-ready. Psst… these guys deliver cocktail premixes home.